The world is mourning the victims of horrific attacks across Paris Friday night. Mourners brought flowers, candles and notes to French embassies in Germany, Greece, Italy and beyond. In France, Parisians paid tribute to the fallen near the sites of the attacks, which left 127 people dead. Scroll through to see the touching memorials across the world. A woman prays near messages and flowers left at a rail cordon close to the Bataclan theater in the 11th district of Paris on Nov. 14, 2015, the day after a series of attacks on the city. Flowers and candles, on Nov. 14, 2015, left outside the Carillon bar in the 10th district of Paris, following a series of attacks in and around the city. Mourners gather outside of the Carillon bar in the 10th district of Paris on Nov. 14, 2015, following a series of attacks in and around the city. A floral tribute is placed next to blood stains near the scene of the attacks at Bataclan concert hall on Nov. 14, 2015, in Paris. A woman mourns outside the Carillon bar in the 10th district of Paris on Nov. 14, 2015, following a series of attacks in and around the city. Flowers, candles and the French national flag with the Latin, "Tossed but not sunk," motto of Paris written on it, is laid outside the Carillon in Paris on Nov. 14, 2015. A woman grieves at a monument for victims at the Place de la Republique in Paris on Nov. 14, 2015, following a series of fatal coordinated attacks in and around Paris the day before. A French Republican guard stands next to the French flag at half mast at the Elysee Palace in Paris on Nov. 14, 2015. Flowers and a peace sign in the shape of the Eiffel Tower are seen outside the French embassy in Greece on Saturday, Nov. 14, 2015, a day after deadly attacks in Paris. Notes reading "I am Paris" and flowers are seen outside the French embassy in Greece on Nov. 14, 2015, a day after deadly attacks in Paris. Flowers were placed outside the French embassy in Rome on Nov. 14, 2015, a day after deadly attacks in Paris. A woman places flowers at the French embassy in Rome on Nov. 14, 2015, a day after deadly attacks in Paris. People lay flowers outside of the French embassy in Berlin on Nov. 14, 2015, in homage to the victims of deadly attacks in Paris a day before. A red carnation is placed by a French flag outside the French Embassy in Berlin on Nov. 14, 2015, a day after deadly attacks in Paris. Candles are placed outside the French embassy in Berlin to form the word "Paris" on Nov. 14, 2015, a day after the deadly attacks in Paris. A note reading "liberty, equality, fraternity" at the French embassy in Berlin on Nov. 14, 2015, a day after deadly attacks in Paris. German police officers arrange flowers brought to the French embassy in Berlin on Nov. 14, 2015, a day after deadly attacks in Paris. A man rides next to the Taipei 101 building, lit up with the colors of the French flag, in Taipei, Taiwan, on Nov. 14, 2015. People lay flowers outside the French embassy in Moscow on Nov. 14, 2015, to pay tribute to the victims of the deadly attacks in Paris. People leave flowers and candles outside the French embassy in Moscow on Nov. 14, 2015, to pay tribute to the victims of the deadly attacks in Paris. A woman with a French flag on her face holds hands with others at a vigil for the victims in Sydney, Australia, on Nov. 14, 2015. People light candles at a vigil held by the local French community in Sydney on Nov. 14, 2015, as Australians express their solidarity with France following a spate of coordinated attacks across Paris. A child leaves flowers outside the French consular office in Lviv, Ukraine, on Nov. 14, 2015, to pay tribute to the victims of the deadly attacks in Paris. Women place candles to form a question mark in front of the French embassy in Prague on Nov. 14, 2015, a day after deadly attacks in Paris. The Oriental Pearl TV Tower in Shanghai is lit in red, white and blue to resemble the colors of the French flag as the Chinese expressed their solidarity with Paris following a spate of fatal attacks on Nov. 13 2015. 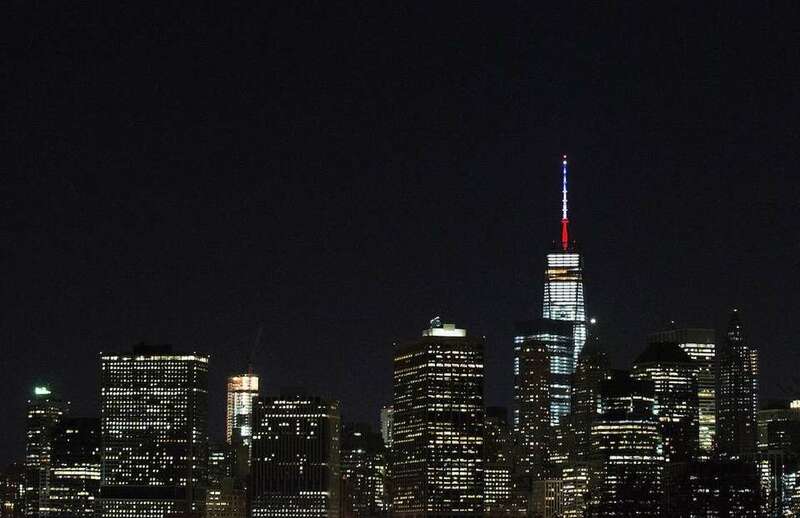 One World Trade Center's spire is shown lit in the French flag colors of white, blue and red in solidarity with France. A woman makes a heart sign with her fingers framing a French national flag placed on the arch at the Washington Square Park during a vigil to show solidarity with the citizens of France on Nov. 14, 2015 in New York. A woman displays a placard during a vigil to show solidarity with the citizens of France on Nov. 14, 2015 in New York, a day after the Paris terrorist attacks. A woman cries outside of the Consulate General of France in New York the day after an attack on civilians in Paris. NYC mourns Paris attack victims: See photosSee photos of New Yorkers paying homage to the victims of Friday's attacks. Mayor de Blasio at Paris vigil: 'Vive la France! '"Our city knows this pain," de Blasio told the crowd.